Lately I have a lot of new things coming up. It gets me anxious if I think about it like I have to do everything perfectly. Lately I have been saying to myself "I put that problem in God's hands" and I feel much better. Getting more sleep helps also. god's hands, I remember that it is not my job to get perfect results, but just to try and be led. Found out that Amazonite and Rose Quartz magnify each other. 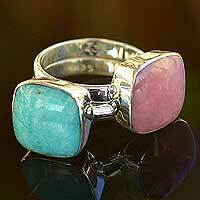 This is a picture of a ring with Rose Quartz (on right) and Amazonite (on left) combined. It was a wonderful experience. I hope to take part II very soon. I have been reading a book about healing, and apparently everybody is connected by cords of light. In your right side, that represents you relationship with your father and the leftt side is your mother. My pains on my right side have strongly diminished. I have been unplugging from my connection with my father. I have been experiencing terrible stomach pain and vomiting for the past 5 or 6 years, every since my junior year of college, and my fourth and final 10-day meditation experience. The experience was deep but left me with unfulfilled issues of a great magnitude. I felt them in my stomach and in acute agoraphobia the day after. I have worked with a healer before, but I am more able to understand the healing when I read about it. I think I am able to process it better in order to heal myself. It feels good to work through issues on a spiritual level. Today my mantra is "I believe"
I am learning today what "I believe" means to me. Sometimes I think that having a desire and manifesting that desire can feel like labor. First of all, you never know how long it will take. Second of all, it can feel painful at times as you wait for that item to manifest. Last, it is such a joyful feeling when you are finally in contact with the object of your desire. So I am having a similar experience recently with a crystal wand. I saw this crystal wand in the shop but it was "too expensive" and this crystal wand has brought up lots and lots of resistance for me. I have gone through painful emotions thinking how I could not afford this particular wand. And then I thought about how I want to buy it even though I don't think I can afford it. Then I thought about the times I went into debt because of this attitude. What I am trying to find is something in the middle. I have been saving money especially for crystals. I don't really have enough saved for this particular item yet. But I think if I wait a month, I can afford the one I found online. So exciting! It took me looking through web sites and accepting that maybe I will only read the description for the crystal. It has everything I want in terms of properties. I think I will wait to buy it, but I am happy that I have found the particular object that I want online. Here is what I have learned about focusing on money: It is always hidden somewhere where you couldn't find it if you didn't look for it. I have savings bonds that I usually forget about, but when I start to feel like my savings are depleted, I remember my invisible money I have stored away in a box. Also, I tend to find extra money in cutting certain expenses that I thought were necessary. Like discretionary spending or entertainment. Lately I have been channeling the affirmation: I can afford anything whenever I want. A website that teaches me how to save on all things except those things I want to buy luxury. I need to read more on this website to post its gold, but I am enthralled right now. In other news, I have attempted crystal healing after finally going to the store, buying 3 or 4 stones, and actually trying it. Now I have tried it three times, and the first two I stayed there for 2 hours or more, and ended up sobbing, crying, releasing some really stuck energy. I even had a vivid dream. I need to continue to experiment with placement etc. I have been channeling the laws of attraction and used my computer to construct a vision board. Basically, a vision board is where you choose images and collage them together which represent your life as you would like to me living it. Mine includes a tree that grows money, a rack of clothes, and a cute little doggy. I also found that the majority of my vision board has pictures of peaceful settings. A large part of what I am looking for is peace of mind. I put this board together using Microsoft paint and Google image search. More news on vision board and manifesting to come. It seems beneficial to state your manifest desire as a "present tense". Such as: I am in the best state of health of all time right now. The of all time stuff annoys me a little, but I read it is good to put "of all time" and "best ever", so I am trying that. My current one is: I am able to buy everything I want when ever I want. I have noticed that whenever I am in a bad situation, when I feel like there is no way out of it, I am trying to learn a lesson but am resistant to it. So, thus, if I focus on figuring it out, and then learning that lesson, gaining that skill, manifesting that feeling as soon as possible, then the bad situation will go away much more quickly. In my experience, bad situations are merely a forceful lesson for us to learn something that we have been afraid/too mad/too resistant to learn. Sometimes these lessons can last years. But once you click and see that it is a lesson, and you need to learn it, otherwise it will just get worse, then you can eliminate that bad situation, and start moving forward very fast. I think that it is harder when the situation is that something you want does not come into your life, be it a person, place or things. If you are trying and trying but the thing you "think" you want does not come into your life, then chances are more likely it is not going to help your growth. If you just focus on the need, instead of the object, what you need will then manifest, and you won't feel unsatisfied anymore, although with a lot of letting go and will power. It is hard. Recently I am working on showing more of myself in relationships. I tend to be "underwhelmed" and so this drives away potential friends. I always think I am overreacting, but it is not so. I try now to express my feelings, especially of appreciation. This is very difficult for me to do. I am learning though. It actually makes me feel better to express my feelings in person and at the time I am feeling them, which is VERY HARD for me to do. I am so scared that I will be too vulnerable. But I will see how it goes. I like to write because it helps me to express my feelings without pressure, and then I can know better how I feel in real time encounters. It is hard to express myself to people, and even on a blog. I do think that there is merit in trying, even when you move real slowly at first. The more tricks and tips you learn though, the faster it picks up, until you have an ability to talk easily to people. Although it is difficult to put myself into situations like that. I am considering right now whether I should sell my art work in a holiday bazaar or not. It will be scary to be around so many people, and to sell my work. I think it will be hard if no one wants to buy my work. But then again, this might be one of those things that makes me better at interactions, and I might realize hey, this is not so bad. But I am really really scared. We walked all the way to the hotel from the parking lot. Our bags were not in our hands because we are checking into a military hotel, and we are uncertain if we need Alex's boss to meet us in person. We check in all aright and are excited to check out our room even without our bags. We quickly run up to the room, open the patio, and comment on the "ocean view" which is really just a bunch of buildings and a little side of ocean with trees, but you know, we can see the sunset and that's all that matters. Tonight is our 2 year anniversary. We go all the way to the parking lot to grab our bags, and wheel them up to the hotel room. I am already full from a nice dinner/lunch that we ate at 3pm, but in Dallas it is 7pm! We are going to have another meal today! Actually neither of us are hungry for a meal later on and we go to sleep at 9. This morning I wake up at 5. Alex is asleep. I decide to take a hot shower. The day is still early, sun is not even out. Alex and I head to breakfast, and opt for the buffet style. I have a plate of bacon/eggs benedict/fruit and then a second plate with more bacon and a make-my-own omelet. I also get juice from a little dispenser on the side of the counter. I get back to the table with Alex, and we see a glass of juice sitting there. So we immediately adopt the attitude that someone has taken our table. And we are confused. The waitress comes over to us and tells us she made it as part of the buffet. It is very tasty. Then Alex figures out how to use the juice dispenser to make the same exact flavor using one third of each type of juice except for apple. The waitress is impressed! The day is a big work day for Alex. We meet his boss, Tom, and Tom's wife, Dolores, for lunch at the same place we had breakfast called the Koko Cafe. Then Tom and Alex head for a meeting, while Dolores and I head for a shopping trip. We find stores that sells all sorts of great stuff. My favorite things are turtles made out of shells. We walk around for a little while, then get some Jamba Juice. Hawaii has lots of mainstream eateries. They even have a Chilis! After our trip, we separate. I walk down to the ocean and lay out. I am still too shy to take off my dress with my bikini underneath. Maybe tomorrow? At night, Alex and I share a cab with Dolores and Tom, and we head to a meet and greet with all different alternative energy representatives. Some actually live in Hawaii! I was denied alcoholics beverages because I forgot my ID at home. It was not fun to try and sneak a beer TWICE and still get caught. Gawd, feels like I am ACTUALLY UNDER AGE again. The waitress felt bad and brought me a Mai Tai, virgin. After drinks, and after the meet and greet, we had dinner at the same place. It was real fancy. I was absolutely full from both meals earlier, so I stuck to the appetizer. The waiter was really friendly. A lot of the service industry is genuinely friendly here! I also would like to note that the shopping is amazing. The corridor which the restaurant was on had every single kind of designer purse store, Tiffany's, Na Hoku, and a ton of local type stores with all sorts of shell jewelry etc. And don't forget the leis! Man, those business functions are tiring! I was wiped out when we got back to the room. Still in Oahu. Took a trip to the suburbs today with Dolores and Tom to visit John and Mary, her brother and sister in law. They have a really cute house out in a neighborhood away from hotels and beaches. We get special donuts, because they are a type that are a favorite of John's. They are like fluffy dough with no holes and all different flavors like Hawaiian and Chocolate, and gooey in the middle. We eat the donuts or "Malasadas" first, then pile into the car and travel over to the botanical garden. We stop at the visitor center to start our walk. There are limited flowers but lots of greenery. The palm trees are the best part. They come in all shapes and sizes, short and fat, tall and thin, little red berries or huge fluffy leaves. For lunch we had Hawaiian fast food, a place called L&L. I had catfish. In Chinatown, Hawaii was having Mardi Gras, and I wore a lei. There was lots of music, drinks, masks, beads and scantily clad ladies. We danced, walked around, and looked for Alex to meet us there. Then we got lost and couldn't find our parking garage for 30 minutes. For dinner, Alex and I ended up ordering a pizza from Dominoes. They delivered to the hotel. The day was really long, fun at times, and near the end a little torturous. This morning I was really sore with a headache. Alex has to work a lot this morning. We don't do anything even though he has the morning off. I stay in the room watching shows on TV and on my computer. Then when Alex comes back from his meeting, we go out to the beach and walk a little. We go to a bar and get tipsy, and also we get a back scratching device free with our drink! We fly out from Oahu to Kauai today. It is like a regular flight only it is 30 min. And we get pod juice which I like. We walk to a restaurant when we land. The weather is much warmer than Oahu. At the restaurant, I order lots of food including shared dessert. Then we go through the garden and take pictures. We all drive around the island during the day. At night, Alex and I go to dinner together and he orders coffee rubbed steak. He has to send it back once, but then we get a free dessert! That night the tsunami hits. All of us have to evacuate to "higher ground" and it is miserable. We just stay in the car the whole night thinking it will destroy our hotel. We stay in front of a big Save Mart which after a while they begin t0 let us in and sell us food. They also have a bathroom which is nice. So I call my parents at 3am Hawaii time because the tsunami is supposed to hit at 3:07, and I am like "Mom and Dad, I don't know what it going to happen, but I love you". In the end, there is not really a tsunami and everyone drives back the hotel. Just an awful night's sleep. We are driving back from tsunami-ville and Alex has to go to work. I am scared to stay home because I still think the tsunami might come. He has to go to a military base and I am not allowed so in the end I have to stay. I just keep the news on and download shows on my computer. Alex finally gets back and we head out for our flight back to Oahu. We arrive at the Hyatt and it is beautiful! Right in the middle of a tourist attraction, the shopping is incredible. We are right across from the ocean and on the 25th floor! We have an ocean view that is amazing! The hotel is incredible. Now begins our real vacation. We go out early to Kailua beach so Alex can go wind surfing. Then we drive around the edge of the island for a while. We get shaved ice from two different places. I get a sun burn. We also see little black crabs all around the rocks. It is so cool. Not a really big day. Just staying in the room. Alex's shoulders are really sunburned. At 4ish we head over to a hiking trail called "Diamond Head". It is a good walk and then a mini hike along the edge of a hill with a great view of the beach. It is a good time talking a little while we are walking. The night is just filled with more walking as we try to find an open restaurant at 5pm. Nothing is open! We can't find anything worthwhile and keep walking for ever. Finally we look up this restaurant on Alex's i-phone and find out it is across the street from the giant parade! It is called the Honolulu festival. There is a crowd on the side of the street and there is no jay walking in Hawaii, because they fine you for it. So we carefully wait for the walk sign to come on and avoid the dragons and dancing hula girls as we walk across. The place is a beer pub that serves great little appetizers. I order like six different things, all that I love! And especially the tuna tartar is really good. Alex gets a roast beef sandwich. The food is really good, maybe the best I have had so far aside from our first meal when we landed. We walk around after this, through the parade again and into a beautiful art gallery. We explore a little more and then back to the room. Ready to wake up early and go kayaking tomorrow. This day is probably the best day of the trip. We are relaxing and know the island at this point. We drive out to a place where we rent a kayak. I am scared to go, but I still want to try it. We push it out onto the ocean and head for a river. The sun is warm and the river is so pretty with the plants on either side. We see ducks and jumping fish. We also get stuck on the rocks for a while but then maneuver ourselves to safety. The kayak is not as scary as I thought, and it is really hard to tip over. Next I am going to go kayak in the ocean! After this, we still want to go to the beach so that I can swim. Yes, that's right, I have not gone swimming this entire week. I just didn't feel like it; it was cold, and I was alone. I didn't feel comfortable. Now I can finally swim and tell people I swam in the ocean. We already bought a boogie board for me to use yesterday. It is the best thing ever and my favorite keepsake from Hawaii, aside from the necklace that Alex bought me with a little sea turtle. When we get to the first beach, the waves are so high! I don't want to go and Alex thinks it looks really fun! I say I can't because the signs say "no swimming" and "WARNING" even though there are a bunch of people out there. But we move on to a different beach and I try out that one. It is just too cold! I am in the shade and the water is freezing! I tell him if we go back to Kailua then I will go swimming. So we drive all the way over there, and I sit out on my boogie board on the sand, and I know that I have to swim this time! So I go out in the water, but only for a few seconds. Alex makes fun of me for going out only for a short time, but then he buries me in the sand up to my waist so I have to go in again to wash off. Finally I enjoyed it, and it was more like me running up to the waves, jumping around, running back, and then going out again, repeatedly about four times. After this we got out last shaved ice :( and it was sad. We traveled a few miles to the airport and waited for our flight, so I got to shop a little in the airport. It was a long flight back and I was so tired. It was 7am when we got back, and I went straight to work that day. Yikes, I can't believe that I was in Hawaii all last week. Now I am just back to my regular work schedule. What a trip. It was cool to see two islands in Hawaii and I can't believe I went. So that was my trip! Glad that you could share it with me, friends, through this little blog of mine!